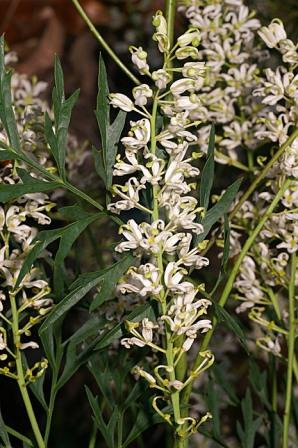 Attractive small shrub 3-6' with pale green fern-like leaves and creamy white scented flowers in summer. Grows well in partial sun or shade. Tolerant of heavy frost,and dry periods once established. They are fire tolerant and reshoot from the lignotuber. Prune when young for bushier growth. Good container plant and cut foliage. Propagation Information: Seed germinates readily. No pre-treaments required.